Rental Tracker installs Costume/Property edition of RTPro for Wiseacre Rentals Inc at Toronto, Canada. Rental Tracker installs Set Lighting Edition of RTPro for Portable Power Inc at San Fernando, California. Rental Tracker installs Set Lighting Edition of RTPro for Coastal Production Equipment Inc at Vancouver, Canada. Rental Tracker installs Set Lighting Edition of RTPro at following 5 locations for Universal Studios. Rental Tracker installs Set Lighting Edition of RTPro for Lite Ideas at Atlanta, Georgia. Rental Tracker installs Costume edition of RTPro for Clearcut Costume at Portland, Oregon. Rental Tracker installs Set Lighting / Truss Edition of RTPro for C&C Studio Services at Pasadena, California & Atlanta, Georgia. Rental Tracker installs Touring Edition of RTPro at 7 locations for SGPS / Showrig. Rental Tracker installs Costume/Property edition of RTPro for Nashville Repertory Theatre at Nashville, TN. Rental Tracker installs Costume edition of RTPro for Southeast Costume at Atlanta, GA. Rental Tracker installs Set Lighting Version of RTPro at 4 locations for Source Maker. Rental Tracker installs Set Lighting Version of RTPro at Light House Film Service at Bangkok, Thailand. Rental Tracker installs Property edition of RTPro for Target Props at North Hollywood, CA. Rental Tracker installs RTPro at 6 locations for Star Waggons. Rental Tracker installs Set Lighting / Camera Version of RTPro at EVS at Glendale, CA. We would like to thank you for spending your time visiting our booth at LDI 2017, held in Las Vegas, USA. We were impressed by the number of visitors and the great interest in our products. Thank you for the time you spent speaking with us during the exhibition. Rental Tracker will be exhibiting at LDI in Las Vegas Convention Center Las Vegas, NV; Visit us at booth 1670. Showcase your equipment and allow your customers to order online! Rental Tracker has re designed the RTPro customer portal using the latest web development technologies. Your customers will experience convenience and 24/7 prodigious customer service. Your business will prosper, be even more efficient, require less redundant, and costly workarounds. Rental Tracker releases version 8.0 of Set Lighting / Audio / Video / Touring edition of RTPro. Rental Tracker installs Set Lighting Version of RTPro at Chicago Studio City at Chicago, IL. Rental Tracker installs Costume edition of RTPro for Eastern Costume at N. Hollywood, California. Rental Tracker installs Property edition of RTPro version 7 for Home Frosting at Tampa, Florida. RTPro User Group Conference for Set Lighting / Audio / Video on February 9th & 10th. Click here for Map & Agenda. Rental Tracker installs Property edition of RTPro version 7 for Studio Service Group at Atlanta, Georgia including RFID solution. Rental Tracker also installs RTI Web module. Rental Tracker installs Set Lighting Version of RTPro at Mels Studios and Post-Production in Canada. Rental Tracker installs Set Lighting Version of RTPro at Motion Picture Compliance Solutions in Sylmar, California. Rental Tracker installs Property edition of RTPro version 7 for GA. Prop Source at Atlanta, Georgia. Rental Tracker installs Property edition of RTPro version 7 for Picture Start Props at North Hollywood. Rental Tracker installs Set Lighting Version of RTPro with the RFID solution at Atlanta Metro Studios. Rental Tracker installs Set Lighting Version of RTPro at Georgia Film Academy. Rental Tracker installs Set Lighting Version of RTPro with the RFID solution at MBS Vancouver at Canada. Rental Tracker installs Property edition of RTPro version 7 for Mojo Prop & Set Dressing Inc at Toronto, Canada. Rental Tracker installs Set Lighting Version of RTPro with the RFID solution at MBS EUE/Screen Gems. Installed RTPro Web Search Module for Vancouver Prop + Costume. Rental Tracker installs Set Lighting Version of RTPro with the RFID solution at MBSE Valley. Rental Tracker installs Property edition of RTPro version 7 for Little Bohemia Rentals at North Hollywood. Rental Tracker installs RTPro at Decades Props & Set Dressing along with website. The website allows user to search RTPro inventory, view image of items, and create shopping carts and much more. Rental Tracker releases version 7.0 of Costume / Property edition of RTPro. RTPro Image App is now available on iTunes. Now users can use the iPhone / iPod touch to take a picture of items and send to RTPro. Rental Tracker installs Costume edition of RTPro at Costume Rentals Corporation. Installed RTPro Web Search Module for OSF (http://osfcostumerentals.org). The website allows user to search RTPro inventory, view image of items, and create shopping carts. Existing productions can view and print their outstanding items. RTPro User Group Conference for Costume/Property on July 16th. Click here for Map & Agenda. Rental Tracker installs Property edition of RTPro at Nola Props. Rental Tracker will be exhibiting at Cinegear Expo in Los Angeles June 5-6th. Visit us at booth 155. Rental Tracker installs RTPro at Goodspeed Musicals. Rental Tracker installs Set Lighting Version of RTPro at 7 locations for Hollywood Rentals. Rental Tracker installs Set Lighting Version of RTPro with the RFID solution at Pinewood MBS Lighting in United Kingdom. Rental Tracker installs Set Lighting Version of RTPro at MBS Media Campus and MBS Equipment Company at 10 locations across US. These installations includes RFID solution at every location. Rental Tracker installs Set Lighting Version of RTPro at Raleigh Studios in Los Angeles, California. Rental Tracker releases iOS version of WB Property Department App on the App Store, as well as the Android version on Google Play Store. This app offers rental customers at WB Property Department a quick and easy-to-use tool to scan the inventory for pricing and details, it also offers the ability to create and share set lists for easy pick-ups. Rental Tracker completes the development of Web Search Module for Warner Brothers Studio at Property Department (https://property.warnerbros.com). The website allows Warner Brothers to present their inventory online to their existing and new clients. Visitors can search the entire inventory and place their Web shopping cart requests online. Customers can print their Contract, Outstanding Sheet, Invoices and more. Rental Tracker releases iPhone scanner to be used with Set Lighting version of RTPro. Rental Tracker installs RTPro at Fox Studios in Sydney Australia. Rental Tracker installs RTPro at Whites Location Equipment Supply Inc. in Toronto, Canada. RTPro User Group Conference for Set Lighting/Grip/Audio/Video. May 12th & 13th. Click here for Map & Agenda. Rental Tracker installs RTPro at Tyler Perry Studios in Atlanta, Georgia. Rental Tracker installs RTPro at Cinelease/Herz in United Kingdom, Greater London. Rental Tracker installs RTPro at Nova Lighting in Augora Hills, California. Rental Tracker installs RTPro at Aquipt in 4 locations of Philadelphia, Chicago, Los Angeles and San Francisco. Rental Tracker installs its Costume version of RTPro at Pacific Conservatory of the Performing Arts in Santa Maria, California. Rental Tracker releases version 6.0 of Set Lighting edition of RTPro. Rental Tracker installs its Set Lighting version of RTPro at Thunder Studios in Long Beach, California. Rental Tracker installs its RFID solution at Sony Pictures Studio - Set Lighting department. Rental Tracker releases version 6.0 of Costume / Property edition of RTPro. Rental Tracker releases version 6.00 of the Costume Property edition of RTPro. Installed RTPro Web Search Module for Sony Pictues at Property department (www.sonypicturesprops.com). The website allows Sony Pictures to present their inventory via a website to their existing and new clients. Visitors can search the entire inventory and place their Web shopping cart requests online. The website shows the pictures of inventory item to visitors to facilitate their selection. The powerful online reports such as outstanding sheet allow web users to see the status of their RTPro orders online without the need to contact the department. Rental Tracker installs its online version of program at Michigan Motion Pictures. RTPro User Group Conference for Set Lighting/Grip/Audio/Video. May 7th & 8th. Click here for Map & Agenda. Rental Tracker announces the availability of RFID solution for both the fixed and handheld scanners. Rental Tracker releases version 5.00 of the Setlighintg edition of RTPro. Rental Tracker redesigns its website. Rental Tracker installs its Set Lighting version of RTPro at EUE/Screen Gems at 3 locations of Georgia, North Carolina and South Carolina. Rental Tracker installs its Set Lighting version of RTPro at New England Studios. Rental Tracker installs its Set Lighting version of RTPro at Paramount Pictures in Pittsburgh. Installed RTPro Web Search Module for Universal Studios at Property department (props.universalstudios.com). The website allows Universal Studios to present their inventory via a website to their existing and new clients. Visitors can search the entire inventory and place their Web shopping cart requests online. The website shows the pictures of inventory item to visitors to facilitate their selection. The powerful online reports such as outstanding sheet allow web users to see the status of their RTPro orders online without the need to contact the department. RTPro User Group Conference for Costume/Property. June 7th. Click here for Map & Agenda. Rental Tracker installs its Set Lighting version of RTPro at Paramount Pictures in Atlanta. Rental Tracker installs its Set Lighting version of RTPro at Paramount Pictures in New Orleans. Rental Tracker installs its Set Lighting version of RTPro at Warner Bros. in Leavesden, United Kingdom. Rental Tracker installs its online version of program at CineBob. Rental Tracker installs its online version of program at CineLux. Installed RTPro Web Search Module for Vancouver Props + Costume (www.vanprop.ca). The website allows user to search RTPro inventory, view image of items, and create shopping carts. Existing productions can view and print their outstanding items. Rental Tracker installs its Costume and Property version of RTPro at History For Hire. Rental Tracker installs its Set Lighting version of RTPro at LimeLight Productions, Inc. in Lee, Massachusetts. RTPro installs online version of Set Lighting program at A1 Medical Intergration, Inc. Rental Tracker installs its RTPro at Sony Pictures Entertainment Digital Editing Department. RTPro installs its Costume and Property version of the program at FilmMaker Production Services Company in Albuquerque, New Mexico. S3 Entertainment Group in Michigan is now using Set Lighting version of RTPro software. Rental Tracker installs its Set Lighting version of RTPro at CineG Rentals in Los Angeles, California. Rental Tracker installs its Set Lighting version of RTPro at Leonetti Company in Pacoima, California. Rental Tracker installs its Set Lighting version of RTPro at Saunders Electric. RTPro User Group Conference March 4th and 5th. Click here for Map & Agenda. Rental Tracker installs its Set Lighting version of RTPro at Mole Richardson Co. located at Hollywood, CA. Rental Tracker installs its Set Lighting version of RTPro at Cinelease, Inc. at 4 locations of Burbank, Chicago, North Carolina and Louisiana. Rental Tracker installs its Costume/Property version of RTPro at Vancouver Props & Costume. Rental Tracker installs its Set Lighting version of RTPro at Pravda Studios at studio rental, in Set Lighting department. Rental Tracker installs its Set Lighting program at KinoFlo in Hollywood. Rental Tracker installs its Set Lighting program at William F. White in Toronto, Canada. Program will be rolled over to 5 other locations, Calgary, Halifax, Regina, Vancouver and Winnipeg by the end of the 2006. Rental Tracker installs its Set Lighting version of RTPro at Paskal Lighting at 2 locations of Los Angeles and Miami. Rental Tracker installs its Costume version of RTPro at Arlington County, Virginia. Rental Tracker installs its Set Lighting version of RTPro at Hydroflex, Inc. Rental Tracker installs its Set Lighting version of RTPro at J & R Productions. Rental Tracker installs RTPro at The Alpha Companies in Sun Valley California. Installation included use of Motorola MC9000G RF Scanners in Wireless and Batch scanning modes. Rental Tracker installs its Set Lighting version of RTPro at Sony Pictures Entertainment at the Production Sound department. Rental Tracker installs its Set Lighting version of RTPro at Steiner Studios at the Lighting and Grip department. Rental Tracker installs its Set Lighting version of RTPro at Source Lighting. Rental Tracker installs its Set Lighting version of RTPro at Warner Bros. Entertainment at the Special Effects department. Rental Tracker adds support for Motorola CS 1504 Batch Scanner. Rental Tracker installs its Wardrobe version of RTPro at Oregon Shakespear Festival. Rental Tracker installs its Set Lighting version of RTPro at Warner Bros. Entertainment Grips Department. Installation included use of new Motorola MC9000G RF Scanners in Wireless and Batch scanning modes. Rental Tracker installs its Costume/Property version of RTPro at Sony Pictures Entertainment Costume Department. Rental Tracker installs its Costume/Property version of RTPro at Walt Disney Studios Property Department. Rental Tracker installs its Set Lighting version of RTPro at Warner Bros. Entertainment at the Production Sound department. Installation included use of new Motorola MC9000G RF Scanners in Wireless and Batch scanning modes. Rental Tracker installs its Costume/Property version of RTPro at Warner Bros. Entertainment at the Drapery department. Rental Tracker installs its Set Lighting product at Industria Superstudios Overseas, Inc. in NY. Rental Tracker Implements Motorola MC9000G RF Scanners and installs at Warner Bros. Set Lighting department. Rental Tracker installs its Set Lighting product at TM Lighting. Rental Tracker installs its Set Lighting product at 20th Century Fox for both Set Lighting and Grip departments. Installation included use of Motorola PDT6846 scanners in Wireless and Batch scanning modes. Rental Tracker installs its Set Lighting product at Warner Bros. Entertainment at Set Lighting department. Rental Tracker installs its Set Lighting version of RTPro at Walt Disney Studios. This new install of the program is being used by 20 departments across the studio by more than 60 users via Citrix. Rental Tracker redesigns its website. Check the screen shots of RTPro for the Setlighting/Audio-Video and RTPro for Costume/Property. Rental Tracker installs its Set Lighting product at Paramount Pictures Studios in Vancouver accessing the centralized database in Hollywood. Rental Tracker installs its Set Lighting product at Culver Studios for Lighting, Grip departments. Rental Tracker installs its Set Lighting product at Westside. Rental Tracker installs its Set Lighting product at Occidental Studios. Rental Tracker installs its Set Lighting product at Paramount Pictures in Hollywood for Lighting, Grip and Canvas departments. Rental Tracker announces Support for Motorola Wireless Scanner PDT6846 and Motorola Batch Scanner PDT6800. Rental Tracker announces version 2.0 of its Costume/Property product. Rental Tracker announces version 1.2 of its Set Lighting product. Rental Tracker installs its Set Lighting product at Hollywood Center Studios. Rental Tracker installs its Set Lighting product at Walt Disney Studios for 3 Lighting, Grip and Moulding departments. Rental Tracker installs its Prop product at Prop Services West. Rental Tracker announces Support for Motorola Memory Scanner CS 2000. Rental Tracker announces the release of its Set Lighting and Audio-Video product. Contact us if you need a demo of the program or you would like more information about this product. Version 1.5 for Costume and Property is released. Sending reports via email, exporting contents of any grid to Excel and many other functionalities are the enhancements to this new version. Rental Tracker installs its Set Lighting version of product at Illumination Dynamics. This is the first ever installation or RTPro at a Lighting company. Illumination Dynamics will also perform beta testing of our product which will be officially released in 3rd quarter of this year. Rental Tracker installs its Property version of product at Davie Brown Entertainment. Rental Tracker announces its new designed official website with more pages, more information and more services. Rental Tracker announces RTCheck, a stand alone program that can be used by productions to do a self checkin of the rented items, before they bring the items back to their vendors. Productions can use this program to keep track of their rental items across many different vendors. Please look at our Downloads page, if you need a copy of this program. Costumers Job Fair in Burbank, California at Western Costume Company. Rental Tracker installs its Property version of product at Warner Bros. Property Department. Rental Tracker announces a Timecard program, designed to be used in touch screen mode. This program keeps track of your employee time both for Payroll purposes and for billing the productions for any labor related work done. This program is free, if you have purchased RTPro Labor Module. Rental Tracker announces the completion of the Labor Module. Rental Tracker announces the completion of the Account Receivable Module. Rental Tracker installs its Property version of product at Sony Pictures Entertainment Property Department. Rental Tracker installs its Property version of product at Universal Studios Property Department. 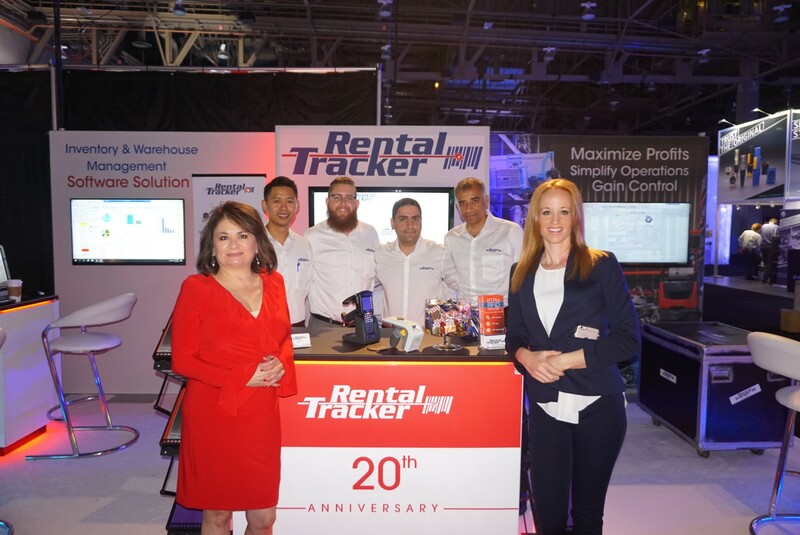 Rental Tracker announces its commitment to develop a Set Lighting Rental Tracking System. Estimated release date Fall 2000. Rental Tracker installs its Costume version of product at Walt Disney Studios Costume Department. Rental Tracker announces the release of its client/server version for its Costume/Props Rental Tracking System. This version works with Microsoft SQL Server 7.0. Rental Tracker installs its Costume version of product at Western Costume. This is the first ever installation of our product.